No one’s about to launch a “Mostly Fauré Festival” these days but I found it interesting that a number of recent CD releases reflect his central position in French chamber music at the turn of the last century. The classical elements of his style link him to his teacher Saint-Saëns, while his Romanticism has passions similar to those of his older colleague César Franck, if more perfumed and less overt. At the same time, his work looks forward to the modernity of his younger colleagues, Debussy and Ravel. Was his music the last gasp of French Romanticism or the first breath of French modernity? Best to leave that for musicologists to chew over while we listen to music that marries emotional power to elegant refinement. Claude DEBUSSY: String Quartet (1893). Gabriel FAURÉ: String Quartet, Op. 121 (1923-24). Maurice RAVEL: String Quartet (1902-03). Quatuor Ebène: Pierre Colombet, Gabriel Le Magadure (vlns), Mathieu Herzog (vla), Raphaël Merlin (vc). Virgin Classics 519045 (http://www.emiclassics.com/). Don’t be put off by the grungy cover art, the members of Quatuor Ebène looking like zonked out models for basic black euro-outfits. These guys can play. More than that, they play with excitement and technical prowess; still more important, they have an acute sense of style that allows them to convey all aspects of these iconic works. 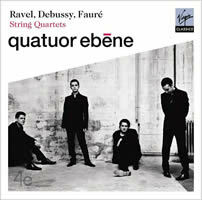 The Debussy and Ravel Quartets are standard discmates, though rarely done with the subtlety and vitality we hear from Quatuor Ebène. They capture the music’s drama, kaleidoscopic colors, and elusive motifs with a spontaneity that makes it sound as if they’re improvising on the spot. The Andantino of the Debussy is moving, done as the composer marked it, “doucement expressif.” If anything, the Ravel Quartet is even more breathtaking in the Ebène’s reading, with the rapt beauty of its slow movement registering through exquisite playing that includes an intensity that heightens its effect. In the propulsive outer movements, the players sweep you along with their exuberance and precision while the pizzicatos of the second movement ricochet like pistol shots. 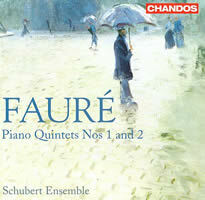 Fauré’s last work, his Op. 121 String Quartet, is sandwiched between the Debussy and Ravel on the disc, as if to cement the connections among the three — a student of Fauré’s, Ravel wrote his Quartet in homage to the tenth anniversary of the Debussy Quartet’s premiere. There’s an ethereal quality to parts of the Fauré Quartet but the work resists being pigeonholed as a somber, reflective look backwards by a dying composer. It may be typical of Fauré’s harmonic adventurousness, use of unison strings and pairings of instruments throughout the work, and of his sensuous timbres, but its last movement is a joyful rondo, as if he was saying goodbye to the world with a smile on his face. Fauré, especially in his late works, is hard to bring off unless the musicians give full due to the subtlety of his harmonic choices and the underlying toughness that mitigates the occasional diaphanous textures of his music. Quatuor Ebène does it all, with the stylistic assurance, elegance, and brilliant musicianship that makes this release a mandatory purchase, not only for the Fauré, but also for the best available versions of the Debussy and Ravel. And if you like CDs that give you more bang for your buck, this one runs over 80 minutes! Gabriel FAURÉ: Piano Quartet No. 1, Op. 15 (1876-79); Piano Quartet No. 2, Op. 45 (1885-86). Trio Wanderer: Vincent Coq (pno), Jean-Marc Phillips-Varjabedian (vln), Raphaël Pidoux (vc); Antoine Tamestit (vla). Harmonia Mundi HMC 902032 (http://www.harmoniamundi.com/). 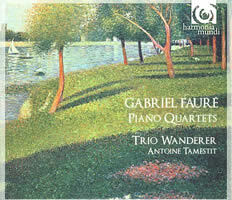 Another outstanding Fauré disc comes from France’s premier piano trio, Trio Wanderer, joined by a guest violist in the composer’s two Piano Quartets. As in Quatuor Ebène’s recording of the String Quartet, we hear the rare blend of intimacy with strength that characterizes Fauré’s chamber music. They bring the impetuous opening to vibrant life, and lend a Mendelssohnian touch to the lightness of the Scherzo, with Vincent Coq’s rippling piano figurations under unison strings in the movement’s middle section a particular joy. In the brooding Adagio, Fauré’s typical way of having instruments emerge from unison string passages is done seamlessly, while the Finale’s bouncing opening, jogging pace, dramatic flourishes, and warm, singing melodies effectively dispel the clouds looming over the preceding Adagio. The Second Piano Quartet premiered in 1887, seven years after the First, and while it shares a superficial resemblance to its predecessor, it displays greater harmonic complexity and comes off as a tougher, tighter work. Its passionate opening immediately grips you and the short, tightly written Scherzo is driven by the piano and pizzicato strings, lending an anxious quality to its energy. A peaceful Adagio with melancholy overtones and a lively Finale close a great work that should be heard more often, especially if it gets a performance as wonderful as this one. Gabriel FAURÉ: Piano Quintet No. 1, Op. 89 (1887-95, rev. 1903-05); Piano Quintet No. 2, Op. 115 (1919-21). Schubert Ensemble: Simon Blendis, Maya Koch (vlns), Douglas Paterson (vla), Jane Salmon (vc), William Howard (pno). Chandos CHAN 10576 (http://www.chandos.net/). Distributed in the US by Naxos (http://www.naxos.com/). Gabriel FAURÉ: Piano Quintet No. 1, Op. 89 (1887-95, rev. 1903-05); Piano Quintet No. 2, Op. 115 (1919-21). Fine Arts Quartet: Ralph Evans, Efim Boico (vlns), Nicolò Eugelmi (vla), Wolfgang Laufer (vc); Cristina Ortiz (pno). Naxos 8.570938 (http://www.naxos.com/). Fauré’s First Piano Quintet was premiered in 1906, but it was on the drawing boards for years — the first sketches date from 1887 and he worked on it intermittently in the interim. The second premiered in 1921, and both reflect a more elusive outlook than the more overtly Romantic Piano Quartets. In both pieces, though, his stylistic fingerprints are writ large: The complex harmonies, shifting rhythms, individual lines emerging from the ensemble, floating melodies, and the piano solidly integrated into the textures are all present and instantly recognizable as quintessentially Fauré. The opening of the Op. 89 is magical — the strings singing the melody over piano arpeggios. The autumnal Adagio can be called “dreamy” in its ambiguous melodies; the Finale, less a summation than a further development of the earlier movements. The Op. 115 shares many of the features of the earlier work but adds a more palpable sense of light and air to the drama of the first movement, while the second movement, with its busily skittering strings and piano prepare us for a long Andante movement that enchants with its grave song and its hints of Beethoven’s late quartets. A Finale builds to a smiling conclusion of the work. The Schubert Ensemble, an English chamber group founded in 1983, are worthy exponents of the music but despite carefully thought-out and well-played performances, their Chandos disc left me feeling that something was missing, most notably that indefinable “French” touch, so hard to describe accurately yet immediately understood when you hear it. They’re good, straightforward performances, but somewhat compromised by an emotional restraint and occasional lumpiness in negotiating Fauré’s harmonic twists and turns. 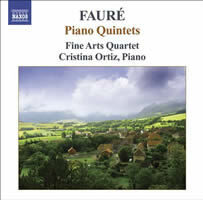 What’s missing is supplied in spades by the Naxos disc, where Cristina Ortiz and the Fine Arts Quartet nail Fauré’s particular combination of classic form and Romantic passion with perfection. They’re more expansive in the outer movements of the First Quintet, allowing for more detail and subtlety while their Adagio is tighter, more focused than their rival’s version. Ortiz’s crisply articulated piano under the busy strings in the second movement is a particular joy here, as is the way the ensemble fully captures the grave beauty of the Andante third movement by taking a flowing, more liquid approach to tempo, rhythm and melody that reflects their awareness of the style we hear in old recordings of French chamber groups of the 1920s and ’30s. One might say the Schubert Ensemble reflects a more homogenized, international approach to the music while Naxos’ Brazilian pianist and American string quartet are more idiomatically Gallic. The result is a disc to treasure. 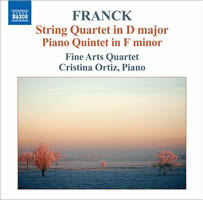 César FRANCK: String Quartet (1889-90); Piano Quintet (1878-79). Fine Arts Quartet: Ralph Evans, Efim Boico (vlns), Nicolò Eugelmi (vla), Wolfgang Laufer (vc); Cristina Ortiz (pno). Naxos 8.572009 (http://www.naxos.com/). Naxos scores again with Ortiz and the Fine Arts’ performances of Franck’s major chamber pieces. Like Fauré, Franck was an early member of the Société nationale, a group founded to promote French music. Saint-Saëns, a founder and co-president of the Société, was the pianist at the first performance of the Franck Piano Quintet in 1880, where its cyclic form, Wagnerian echoes, and complex harmonic modulations shocked the audience. Today the Quintet seems a much tamer animal, though its ripe late-Romantic expressiveness still makes it anything but a concert staple. It’s a large-scaled work in three movements (like Fauré’s First Piano Quintet), full of expressive swings and knotty contrapuntal writing that sound more Germanic than French. The piano is given a bolder presence than we hear in Fauré’s tighter ensemble writing: Indeed, the work’s dramatic introduction in the strings is followed by a calm piano cadenza reminiscent of the second movement of Beethoven’s Fourth Piano Concerto. We hear a further reference to Beethoven in the Finale of the String Quartet, premiered in 1890, the year of Franck’s death. It begins with a reprise of earlier movements, followed by vehement passages that subside into mellower ones before the final climax. The Quartet is another large-scaled work, almost 45 minutes in this performance, and often sounds as if it had been conceived as a big orchestral piece. The Larghetto opens with a gorgeous long-limbed violin melody and the movement becomes increasingly intense as it progresses. Notable, too, are the fugal elements in the first movement and the muted strings in the Scherzo. Franck requires a bigger, bolder approach than Fauré’s equally complex but more subdued style and Ortiz and her colleagues are fully up to it, their leaner textures in the Fauré works here morphing into a riper, blooming sound appropriate to the required emotional fireworks.